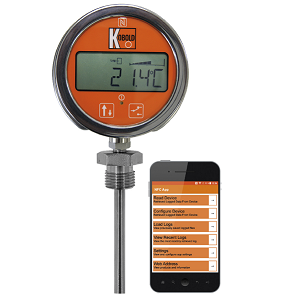 INSTROTECH has on offer Kobold’s DTE series of digital temperature gauges. This series offers a wide range of industrial and analytical possibilities for applications where high accuracy and clear indication is required, and where alarm control and displayed messaging is either useful or a requirement as in controlled environments such as hospitals and scientific laboratories. In addition, the DTE also incorporates data logging, is accessible via NFC interface with mobile devices, and is USB PC configurable. One of the key aspects of the DTE series for engineers, is the mechanical case mounting options that follows the traditional Bimetal, Nitrogen Actuated, and Mercury (now prohibited) mechanical gauges. The Universal Pt100 Class A and Class 1 thermocouple sensors offer not only accuracy and flexibility regarding sensor options, but in the event of the sensor being damaged in service, instead of replacing the entire instrument, only the sensor need be replaced. The instrument may also be reused for other applications where a different type of sensor specification is required.